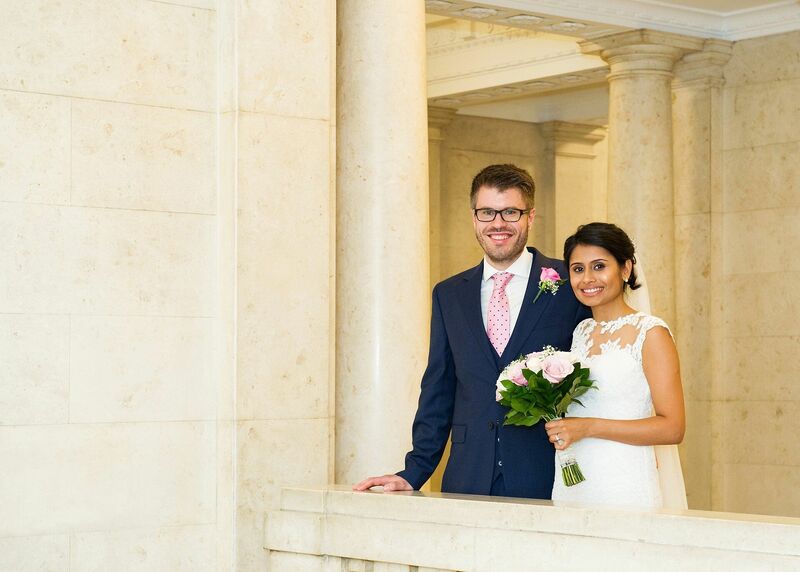 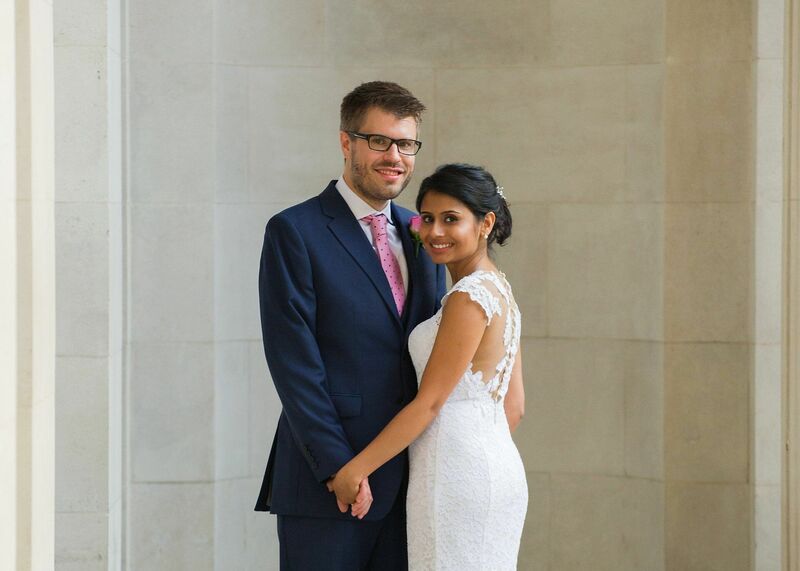 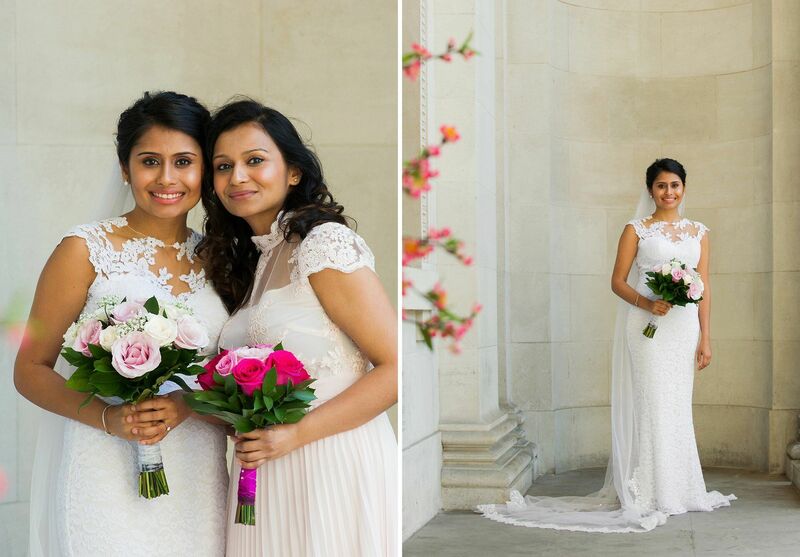 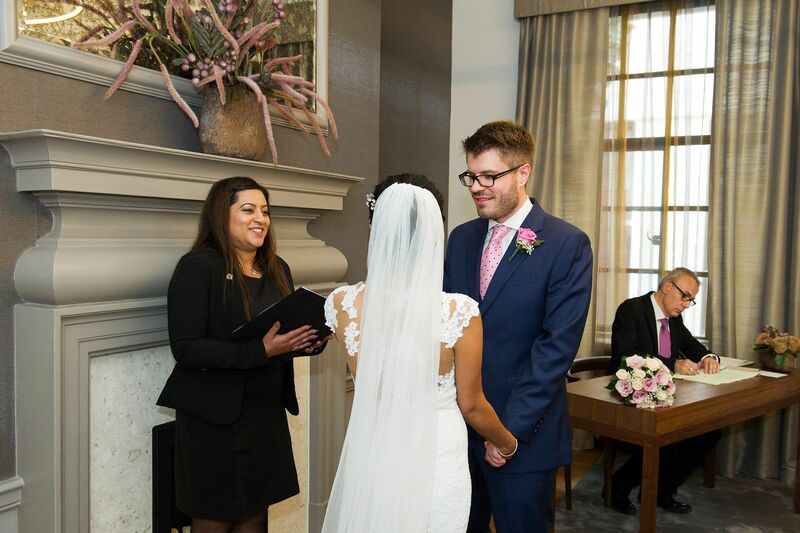 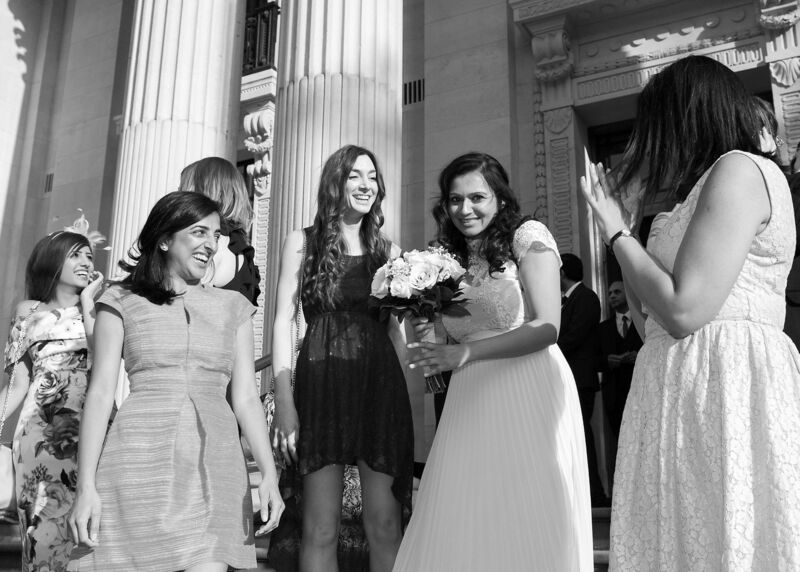 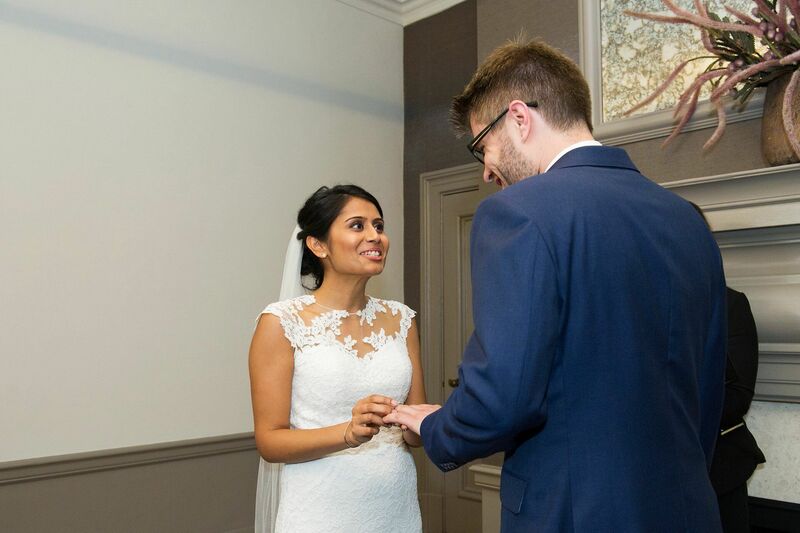 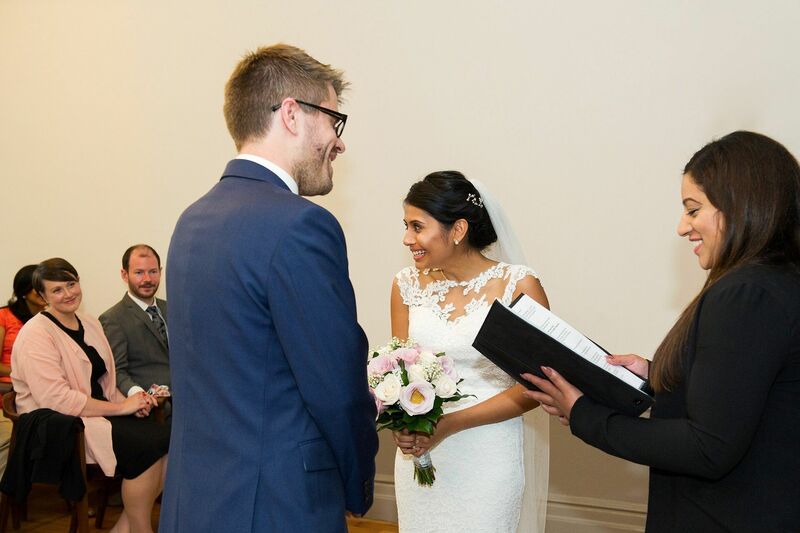 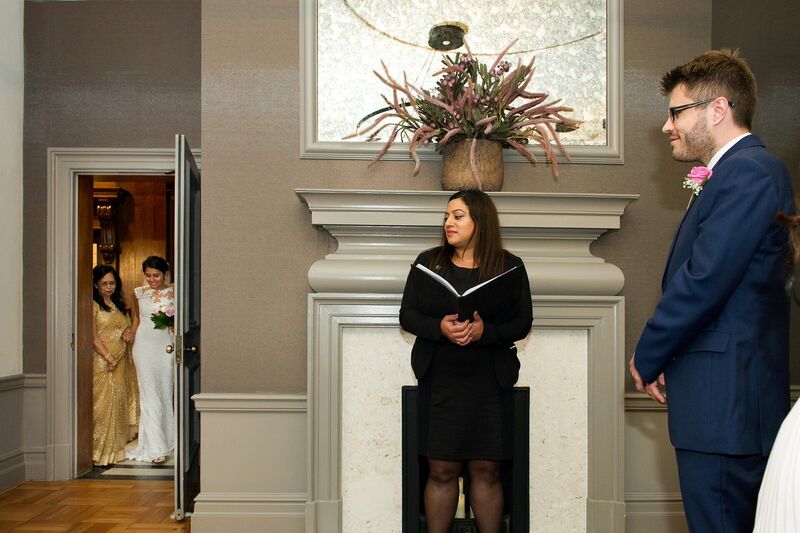 Sinita and Tim contacted me in March to discuss their Mayfair Room wedding photography at Old Marylebone Town Hall. 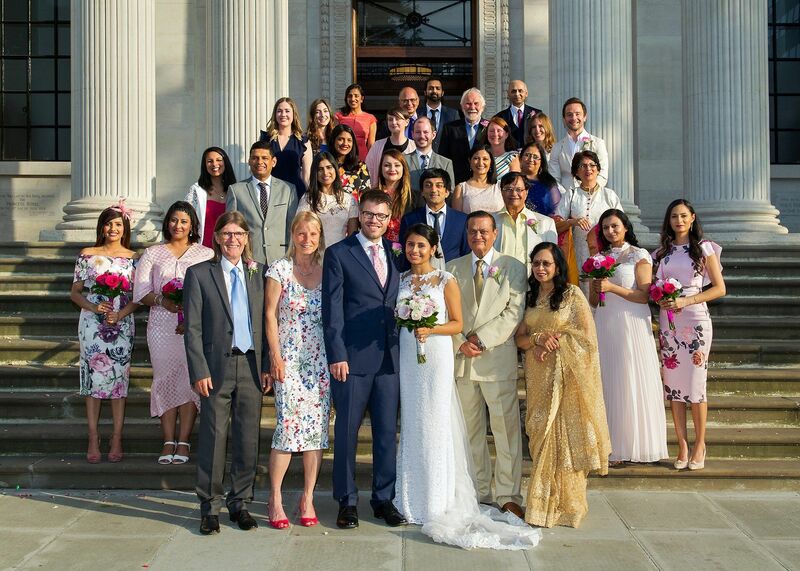 They were planning a small wedding with 30 guests, a mix of family and friends. 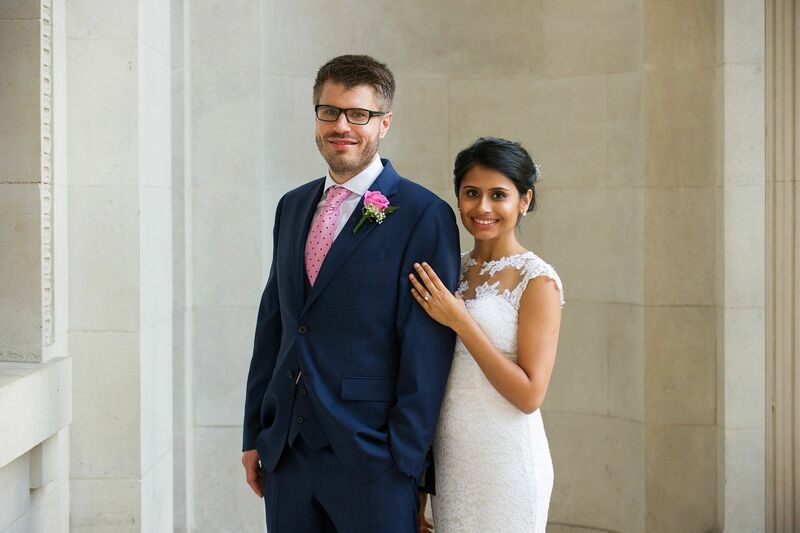 The Mayfair Room at Old Marylebone Town Hall was the perfect size and has a lovely Scandinavian feel – muted plaster walls with a feature wall in mocha. 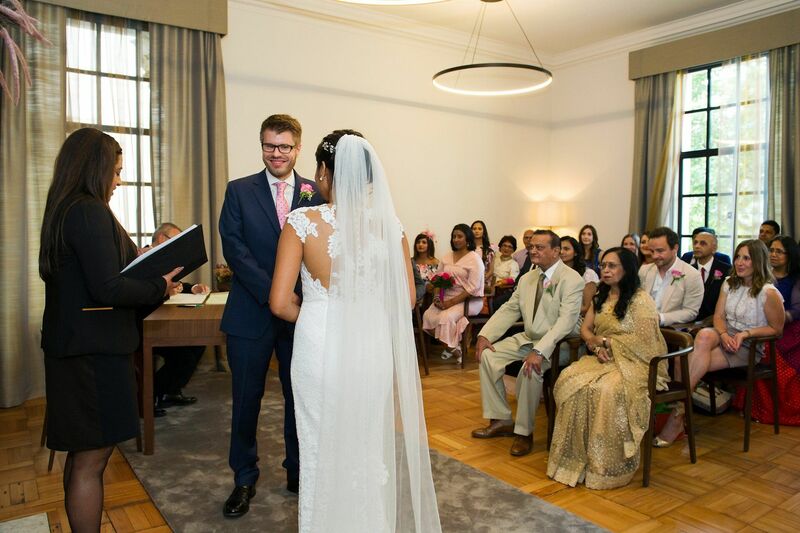 Sinita and Tim were very keen for some natural, relaxed and un-posed photographs as well as the family formals and couple photographs. 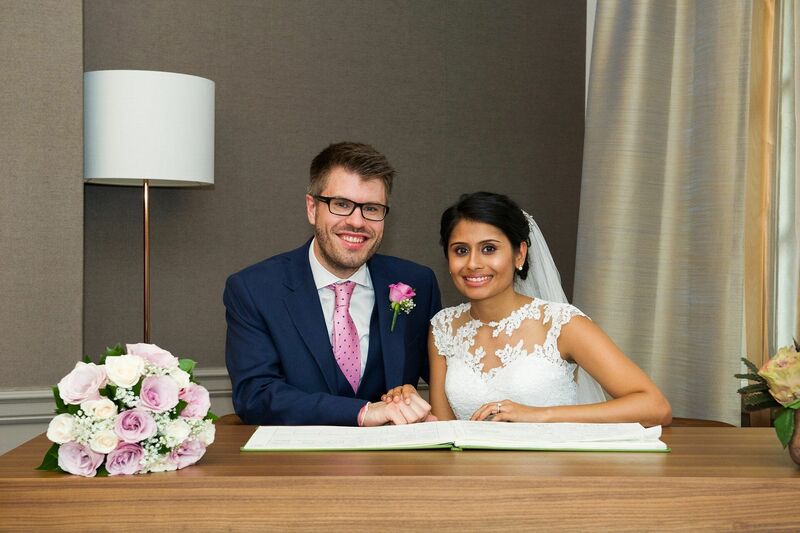 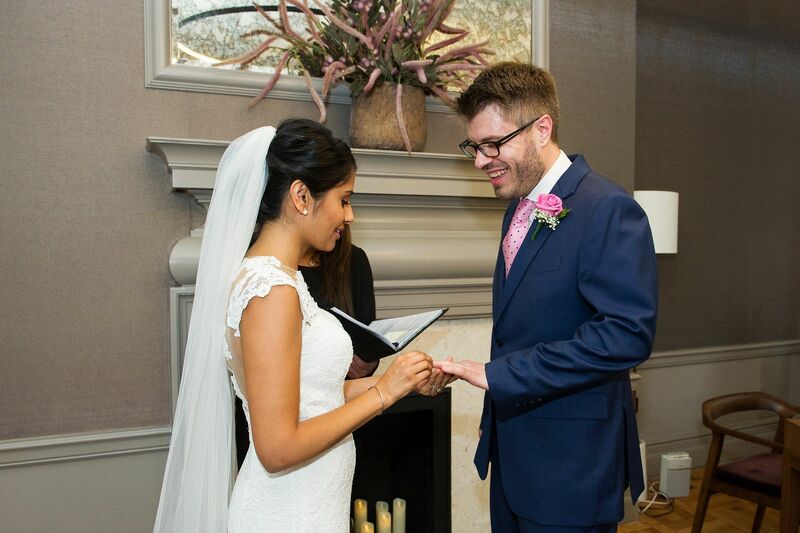 My one and a half hour coverage suited their plans perfectly as they didn’t need me to join them for their drinks reception at Chai Ki in Canary Wharf. 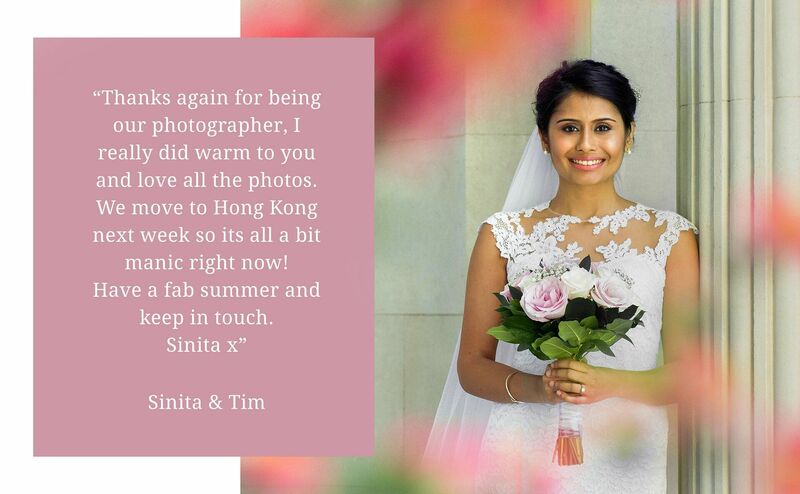 Sinita wore a full length dress with lace overlay and sheer cap sleeves. 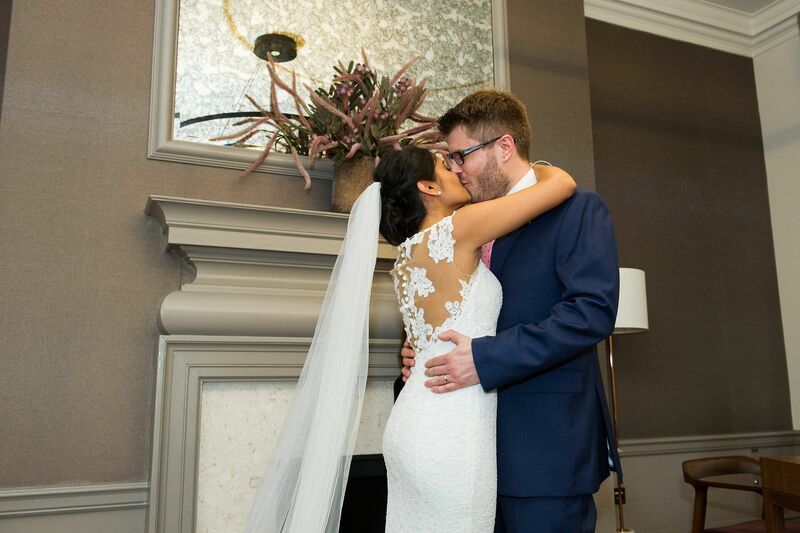 She wore a cathedral veil with lace trim. 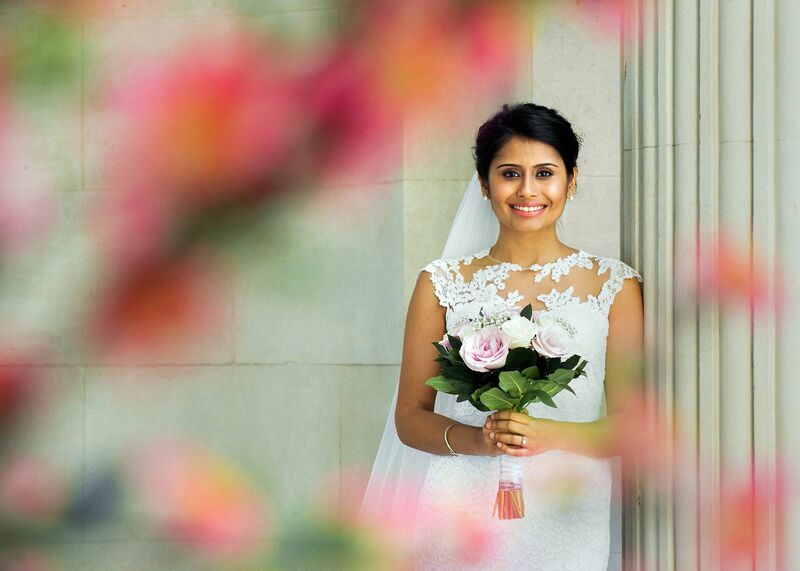 Simple pearl and diamond earrings and a pale pink and cream rose bouquet completed her classic look. 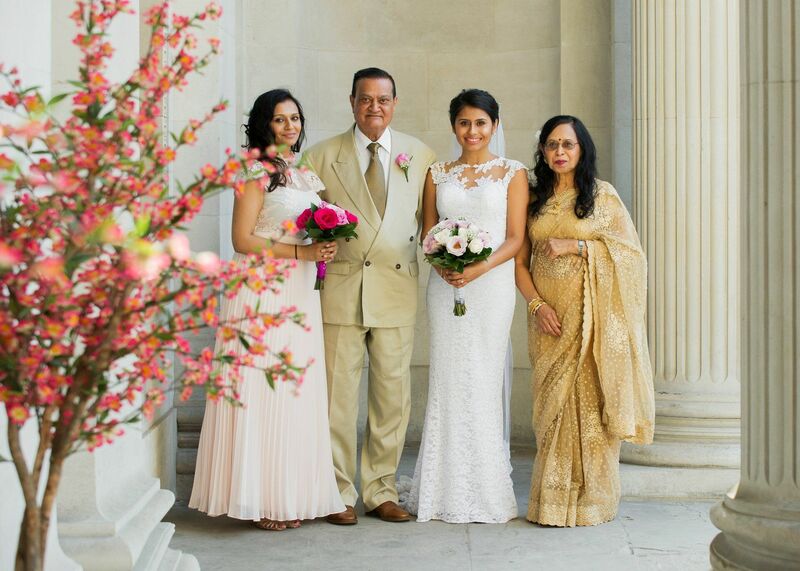 Underneath the fluted columns she looked stunning with her family, sister and on her own seen through the spring flower display at Old Marylebone Town Hall. 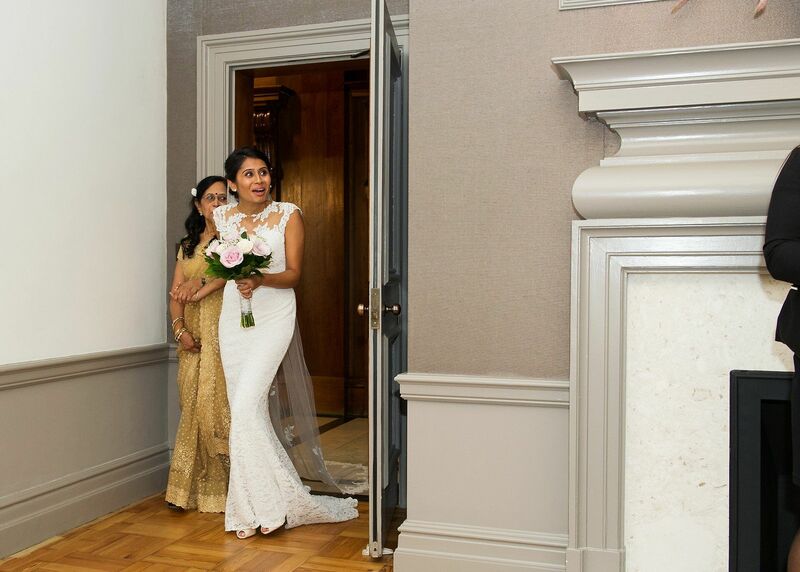 Sinita entered the Mayfair Room behind her four bridesmaids. 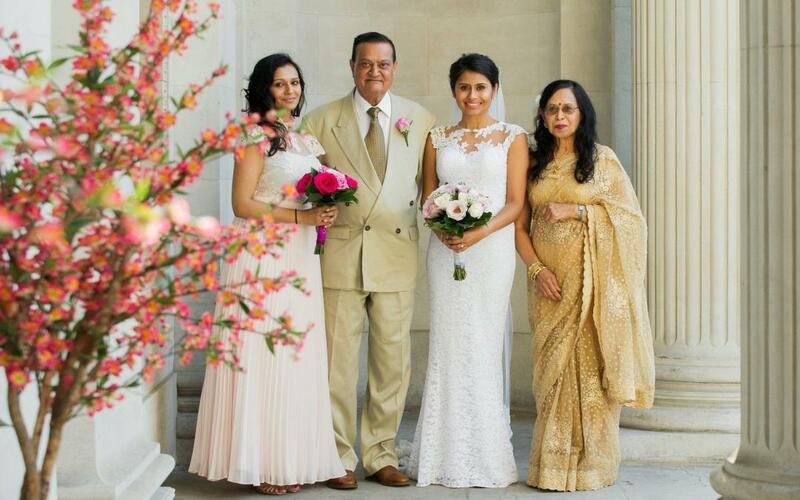 She was accompanied by both of her parents. 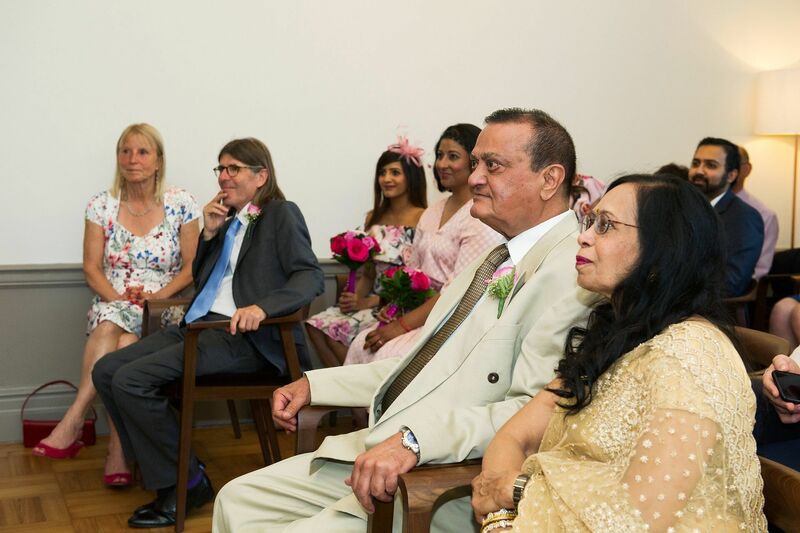 The ceremony included a reading by Sinita’s sister, Dixita, who also delivered the rings. 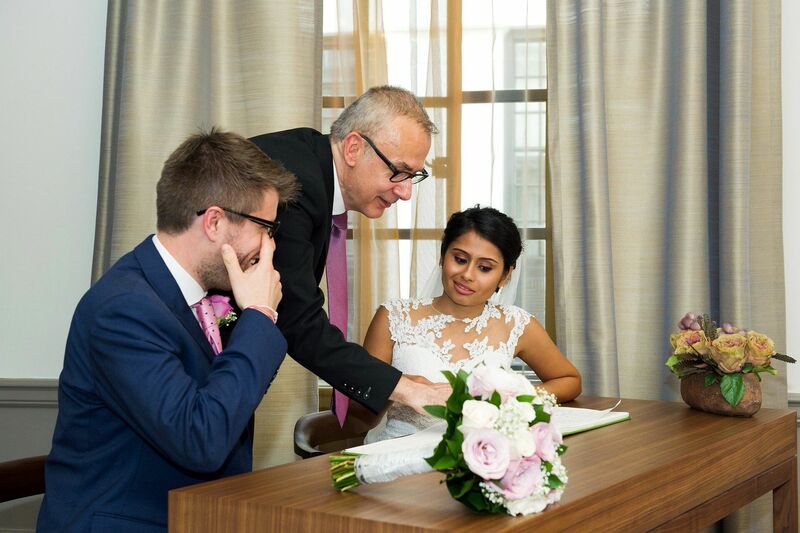 Tim’s father, Steve, and Dixita signed the Register as their two witnesses. 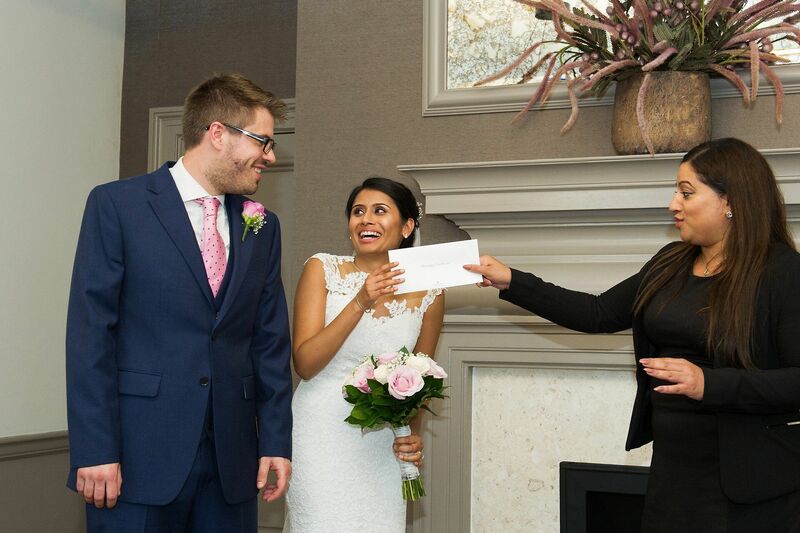 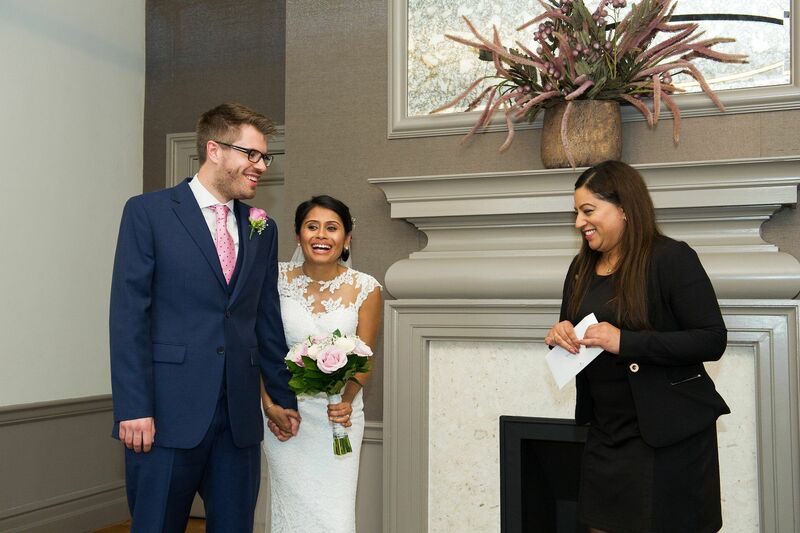 Throughout the ceremony Sinita’s very expressive face made everyone smile. 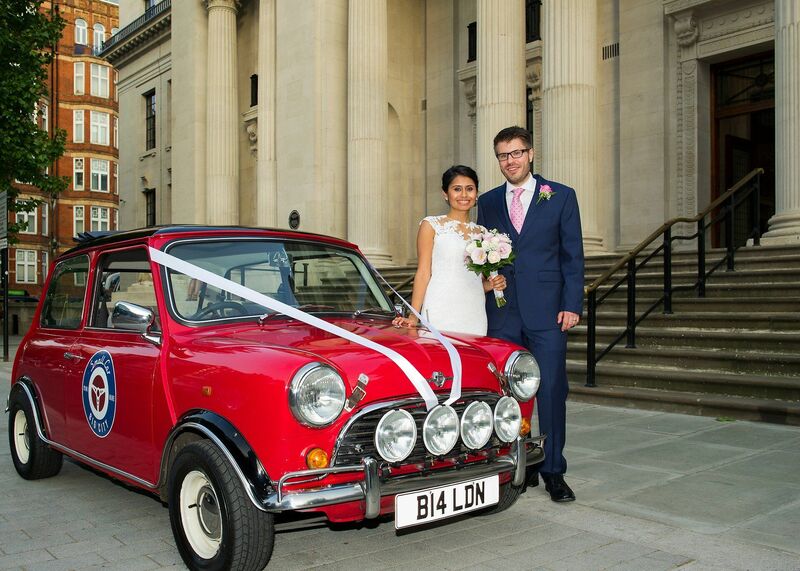 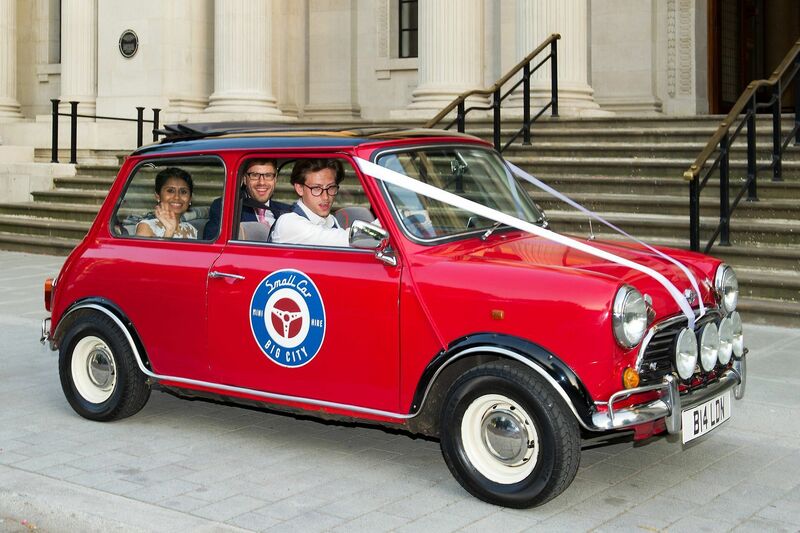 After their group photography I took a few photos of just Sinita and Tim and then they climbed into their bright red vintage mini (Small Car Big City) and headed off towards the City. 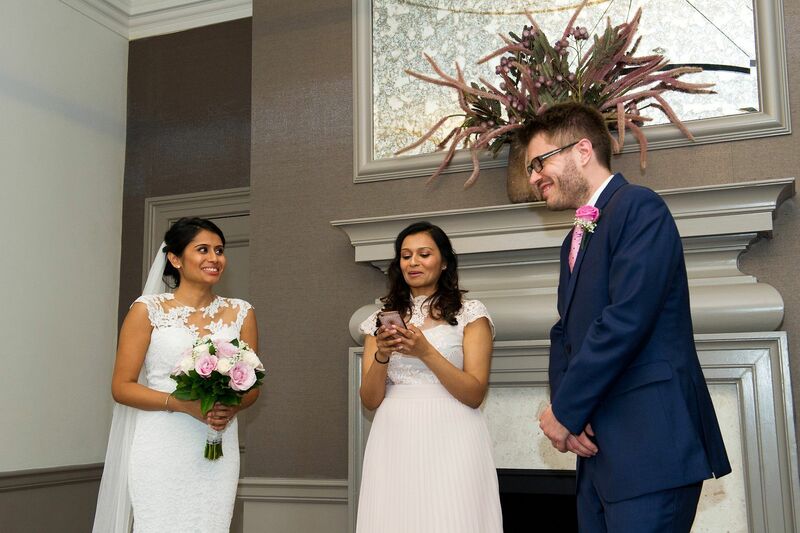 Huge thanks go to Dixita and Arwina (pre ceremony), Bhavin (bag monitor) and Nimi for helping with the groups. 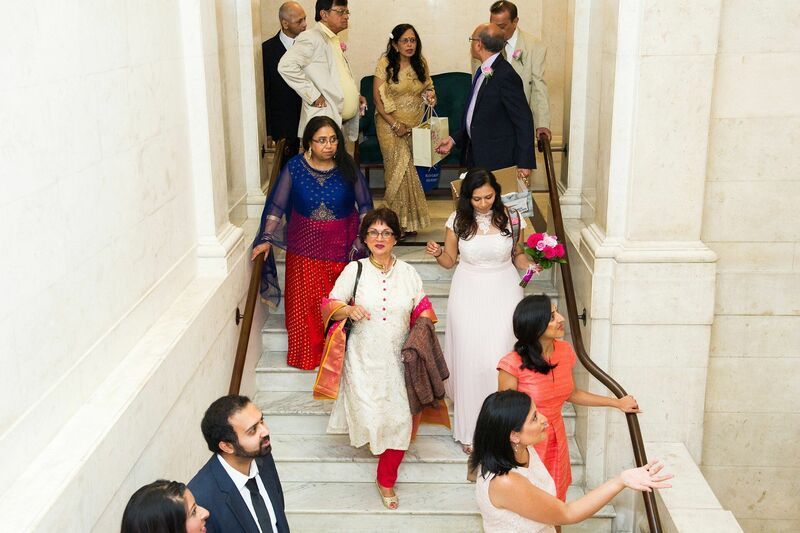 It was a spectacular wedding full of Indian colour and spirit. 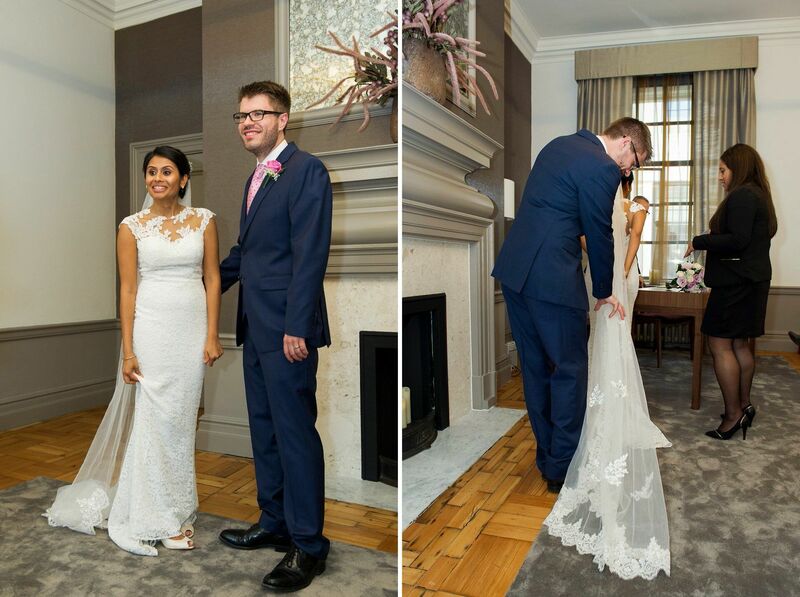 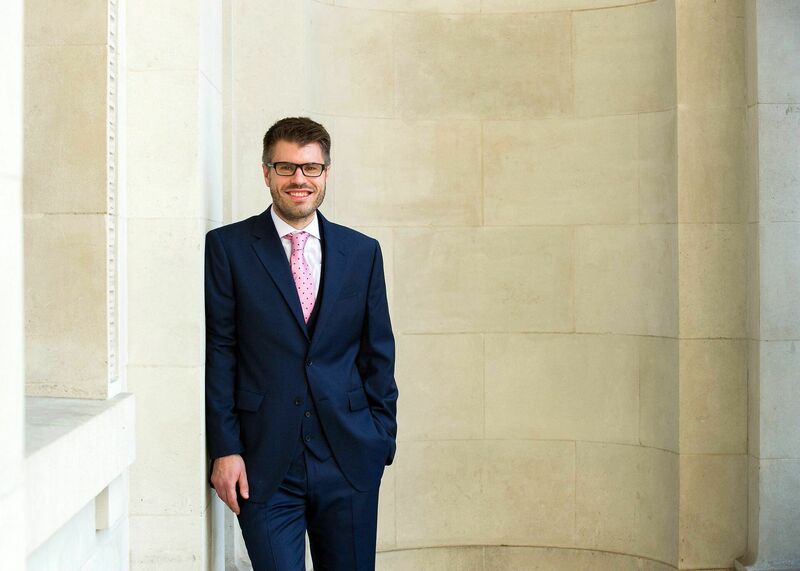 I have now photographed 2 weddings in the Mayfair Room and I really like the light in it – it’s bright and warm. 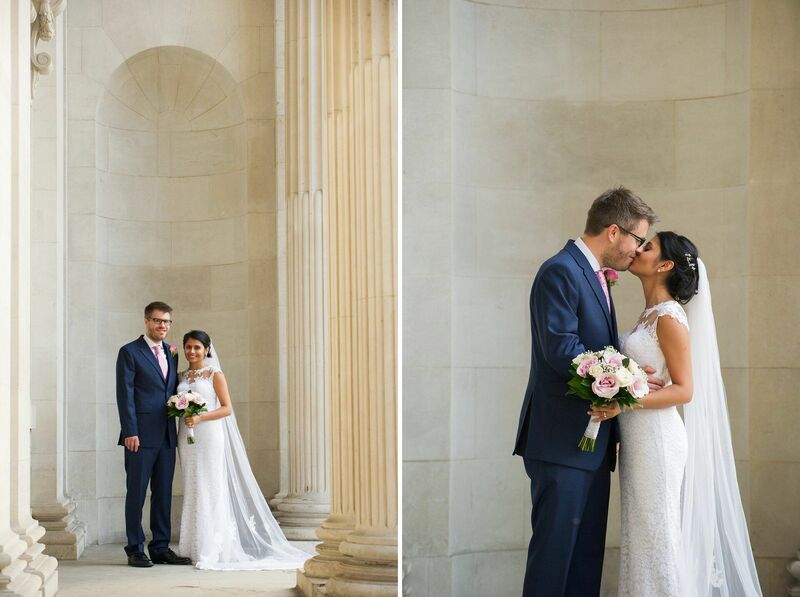 I have 2 more to photograph in 2018 and I am really looking forward to being back. 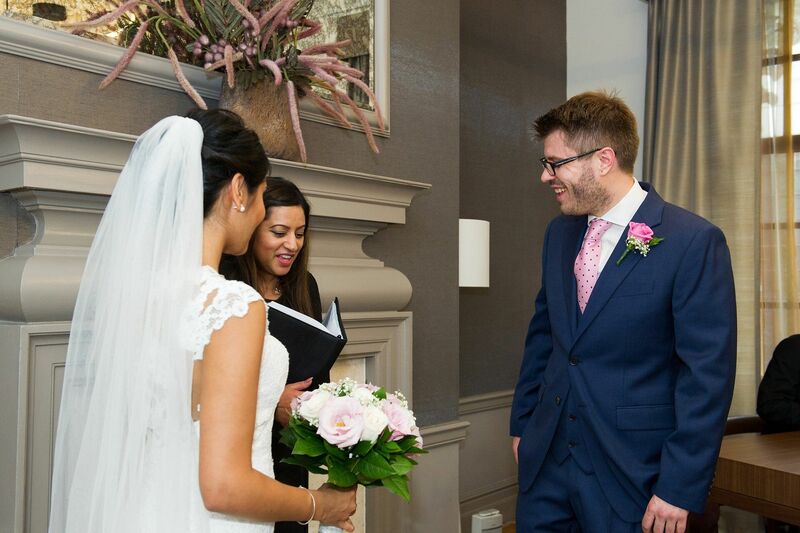 If you would like to see some photos of the Mayfair Room without people do have a look at my Mayfair Room page. 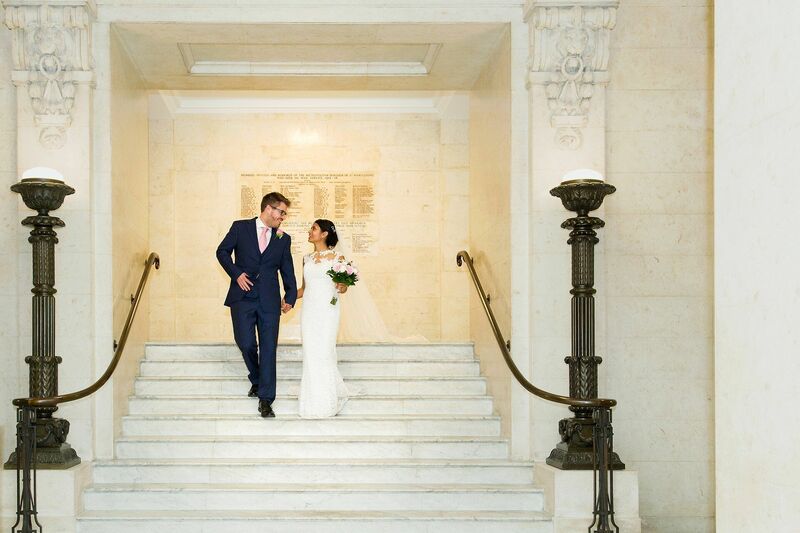 And if you are looking at Old Marylebone Town Hall as a potential wedding venue do visit my Old Marylebone Town Hall page. 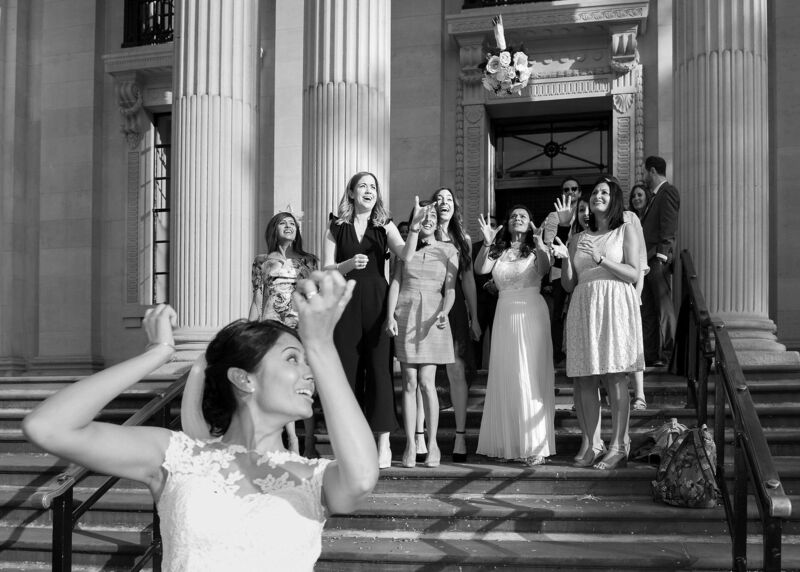 I cover over 30 weddings per year at Old Marylebone Town Hall and it really is my very favourite place. 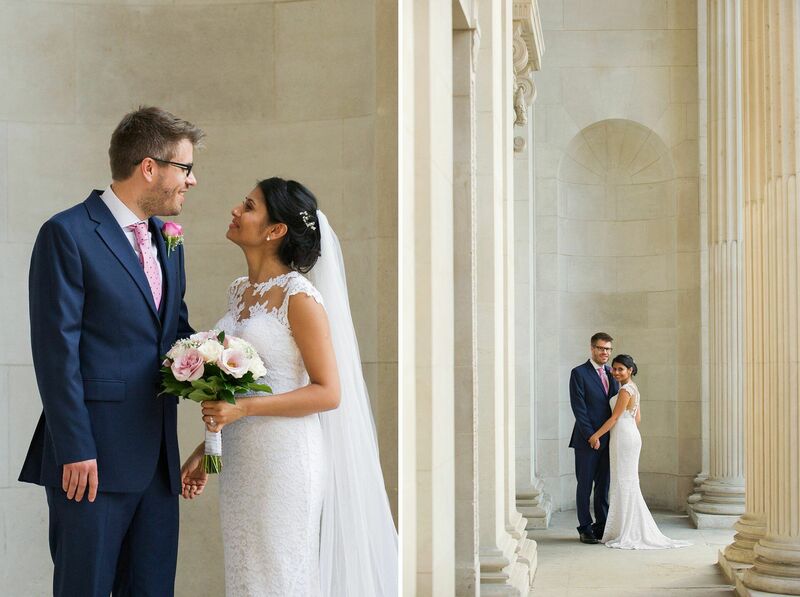 If you have any specific questions or would like to discuss your Mayfair Room wedding photography please contact me or call me on 01342 811631.